This article is a brief introduction about multi-site call center development in relation with Ozeki VoIP SIP SDK. After reading through this page you will be fully familiar with all the essential terms concerning multi-site call centers and what you will need for creating your own solution using Ozeki VoIP SIP SDK. What is multi-site call center? Multi-site call centers are the latest inventions among call center solutions. The biggest companies, who receive millions of customer calls a year use this technology for making call center operations clearer. Multi-site call centers are usually separated from each other and serve different purposes. This means that a company can have a call center for user problems and another one for the sales department or user registration. These call centers can be operated by the same company but it can be delivered to other companies too. It is essential to be sure about the details about multi-site call centers before you start to create this solution. You need to be sure what purposes will be served in the separate call centers and you need to ensure the possible cooperation of these solutions, therefore designing the solution is really important in this case. Ozeki VoIP SIP SDK provides you the support for call center development, you only need to know what you want to implement and call the proper methods for your purpose. The actual implementation depends on the company policies and business logic you use. 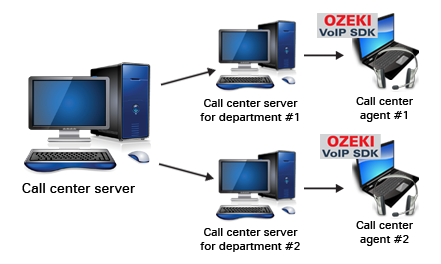 This article introduced you the basic knowledge about building multi-site call-centers and showed how Ozeki VoIP SIP SDK can help you to fulfill your wishes about this topic. If you have read through this page carefully, you already have all the knowledge you need to start on your own solution.